*BE.TRVE.TO.THY.FRYNDE. (The stops being triangular punches). The exterior of the hoop is keyed all over to take enamel, with traces of a green enamel remaining. Flanking each edge is a narrow flange. 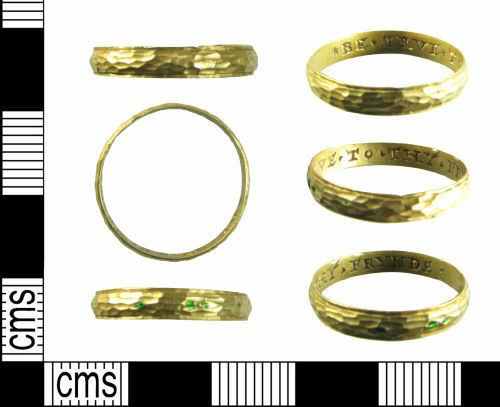 The hoop of the ring is 3.12mm wide and D-shaped in cross-section (being 0.89mm thick). It has a diameter of 16.27mm and weighs 1.20g. Consequently, in terms of age and precious metal content, the object qualifies as Treasure under the stipulations of the Treasure Act 1996.